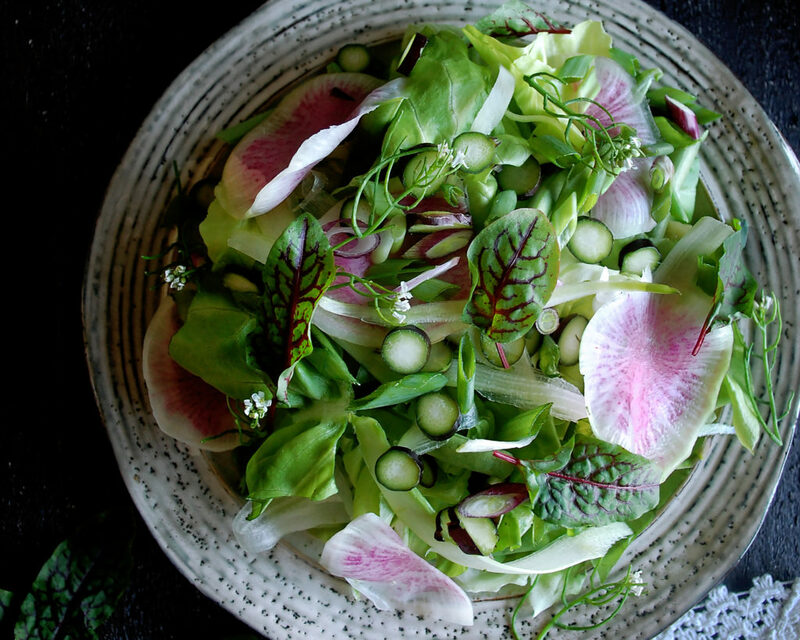 The best way to make a salad is finding what looks beautiful at the farmer’s market and throwing it together with an interesting vinaigrette. When I do these types of salads, where the ingredients are as fresh and seasonal as can be, I like to make it a no fuss kind of thing. The whole point is to let the lettuce, vegetables, fruits, herbs, etc. speak for themselves. When produce is in season, it is at the peak of its flavor. This usually means everything tastes a little sweeter, a little fuller. In this salad, for example, I found some beautiful butter lettuce that was as rich and subtly sweet as can be. With the produce at its peak, the best way to enjoy it all is to just leave it alone. Whatever I find that looks beautiful, I’ll prepare it simply in a way that makes sense for each ingredient. 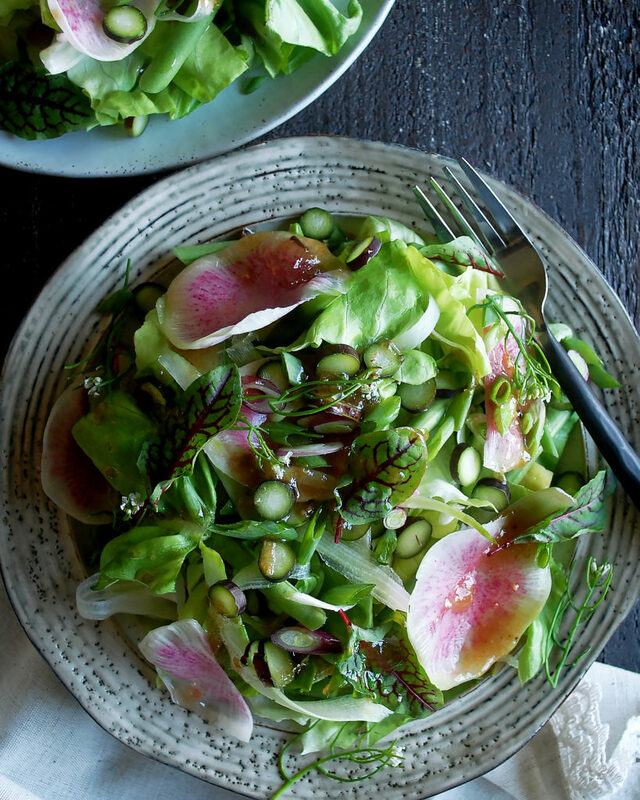 In this salad, I took a watermelon radish and thinly shaved it so you don’t bite into a solid chunk of bitter radish. For the green beans, I didn’t even need to cook them. They were so soft and sweet, so I just trimmed and halved them. For the asparagus, I cut some into coins and some into thin strands. By varying the textures, you add more depth to the salad. All these techniques are minimal and basically just use knife skills to highlight the ingredient in the best way. This is exactly how I treat every ingredient in a “market” style salad. And that brings up a point that is also key when constructing a salad like this – the ingredients can vary, and should vary. The essence of a market salad is that it includes whatever is at the market in a given month, week, or even sometimes it can vary by day. There is no set combination of lettuces, greens, vegetables, fruits, fresh cheeses, and even meats (or anything else you can think of) that you need to use. It should vary by season and what the local farmers are growing. 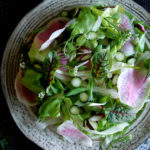 The salad I have pictured is a combination of butter lettuce, watermelon radishes, purple asparagus, French green beans, avocado, red sorrel leaves, and basil flowers. I actually made it a few weeks ago, so the ingredients could be completely different if I had made it today. That’s the fun part about it, you’ll never know what you’ll get. My suggestion, though, is to always keep it simple and somewhat minimal. You don’t want to have 20 different ingredients in one salad…it overwhelms the palate. And so, once you have your ingredients picked out and prepared, it’s time to make a dressing. In this case, a black garlic vinaigrette (which I’ve been making over and over again). You could change it up and try this charred lemon vinaigrette, too. Any type of dressing should have a ton of flavor, and by using black garlic, the work is done for you. Black garlic is produced by fermentation and is incredibly sweet, complex, and truly unique. It’s soft, too, just like roasted garlic, so you can easily blend it into a vinaigrette. I just love it. It adds so much good flavor to the salad, and I can never get enough of it. Where to find black garlic (other than the farmer’s market) – blackgarlic.com or any Whole Foods Market. I hope you’re inspired to head out to a farmer’s market and find all that this season has to offer. When you begin to cook with the seasons and from local farmers, it becomes addicting. Enjoy! Combine all the ingredients in a blender and blend until smooth and emulsified. Taste and adjust the salt if needed. 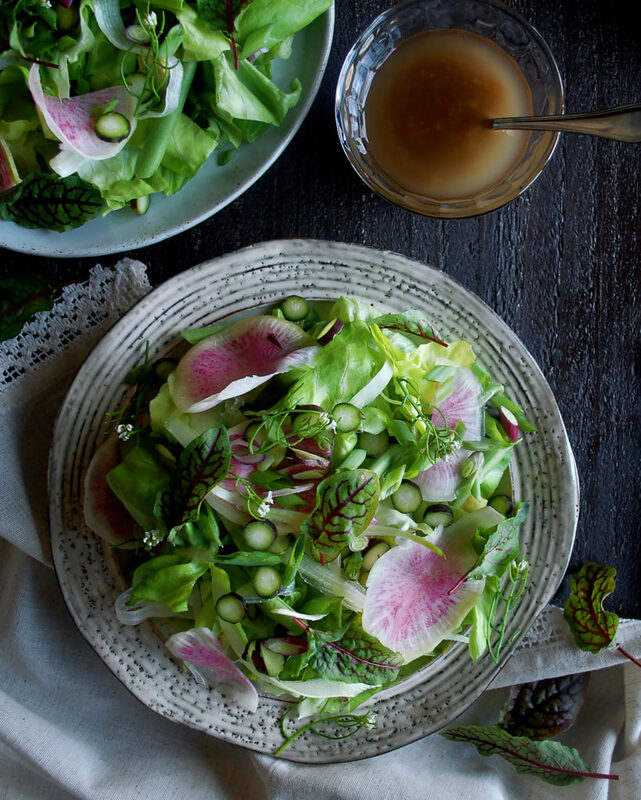 Let the vinaigrette sit for at least 30 minutes so the flavors can intensify. Trim the butter lettuce and roughly chop or tear it into pieces. Work gently with the lettuce so it doesn’t bruise. Peel the watermelon radish and thinly shave it on a mandolin. Trim the French green beans and slice them diagonally in half. Dice or slice the avocado. Slice four of the asparagus into ¼-inch coins. Continue to peel the other four to create thin strands. Arrange the lettuce and vegetables onto a plate. Garnish with the red sorrel leaves and basil flowers. Drizzle the black garlic vinaigrette over top. 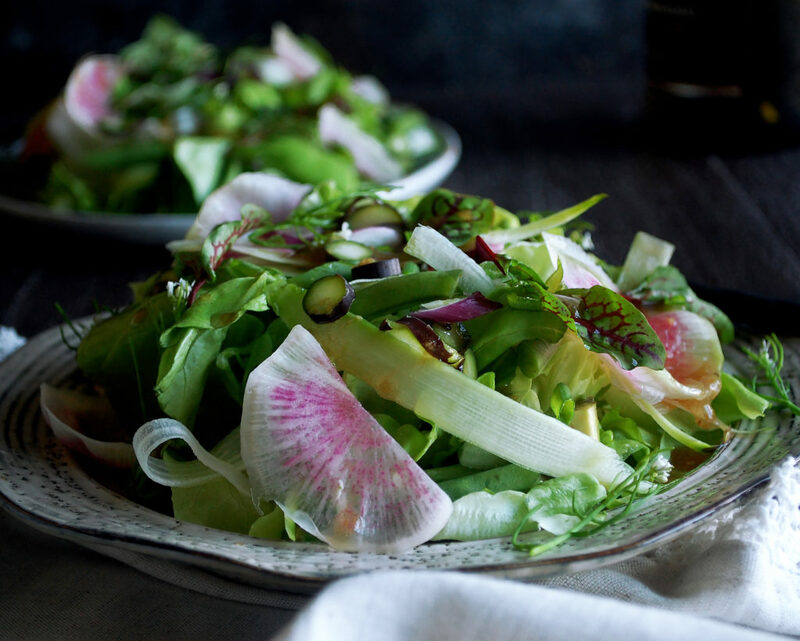 You can make this salad with any fresh, seasonal lettuces, vegetables, or fruits you find at the farmer’s market. You can also add other ingredients such as toasted nuts, fresh cheeses, or dried fruits.